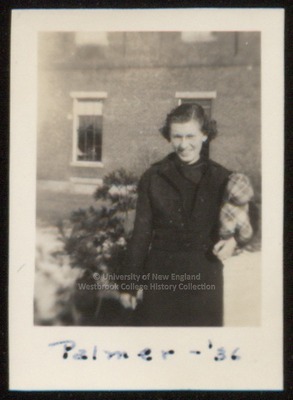 Westbrook Junior College student, Helen Palmer, stands beside an evergreen bush and in the snow in this black & white candid snapshot with "Palmer - '36" written on the front in blue ink. On the back, in blue ink, is written "Helen." Helen wears a dark, slender winter coat and holds a plaid stuffed animal, or perhaps a rolled-up stadium blanket, in the crook of her left arm. Beneath her coat and visible at the neck is a dark sweater or dress top. Helen's dark, curly hair is parted on the left and held back on the right with a barrette or bobby pin. She wears plain, rimless eye glasses. She smiles and looks down a bit, rather than directly at the camera. Behind Helen is a brick wall and windows, possibly the outside facade of either Hersey Hall or Goddard Hall.